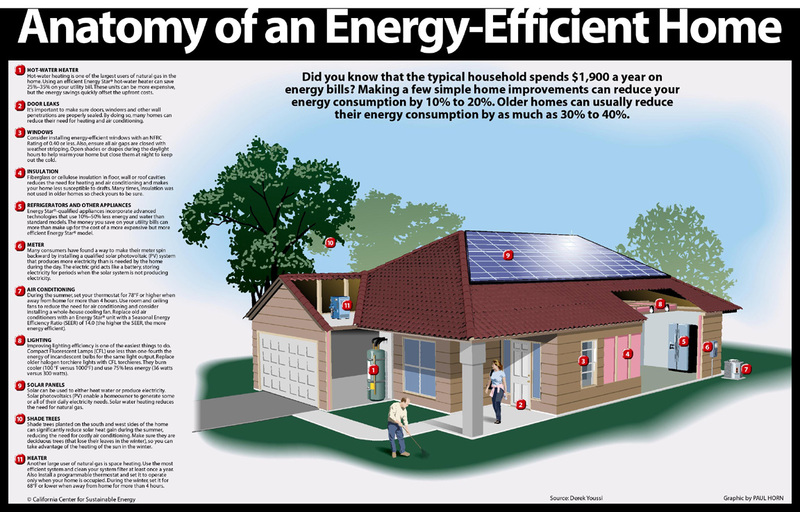 An energy-efficient house is tantamount to keeping winter heating bills down. By conducting a fall season home energy audit, no doubt you will find ways to save energy at home this winter. To ensure an energy-efficient home this winter, grab a pen and notebook, and take a tour of your home and conduct your own home energy audit. Start with the furnace. Check to see when you most recently had your furnace cleaned. It should be cleaned every year, even if it is a gas furnace. A clean furnace is crucial for ensuring that it is operating safely and efficiently. Next on your home energy audit is to check all the doors and windows and confirm that they open and close properly. Inspect the weatherstripping to confirm that it’s in good working order, as well. Ideally, examine the doors and windows on a cool, windy day so that you can check for drafts. The attic is the chief culprit for winter home energy loss. Heat rises, and if the attic is improperly insulated, heat from the lower living areas of the home will find its way into the attic and eventually out of the home via the ridge and soffit roof vents. Inspect the attic for proper insulation. Depending upon where you live, you should have at least R-30 or R-38 insulation in the attic. Make sure that when inspecting the insulation, you check for small breaks. Even the smallest of uninsulated areas in the attic can lead to a dramatic reduction in energy efficiency. Next take a look at the shower heads in your bathrooms. Heating water is another major culprit in high energy costs. By replacing the old shower heads with low-flow shower heads, you can dramatically save energy at home. After addressing the big-ticket items in your home energy audit, look at the electrical appliances and light fixtures. By replacing the standard incandescent light bulbs with compact fluorescent light bulbs, you can reduce your home’s lighting energy consumption by as much as 70 percent. Also, if you have the budget, consider replacing some of the old appliances — for example, the refrigerator, dishwasher, microwave and washer and dryer — with Energy Star appliances. So conduct your own home energy audit this fall, and implement some, if not all, of the suggestions I recommended. By doing so, you will be guaranteed to have an energy-efficient house this winter.